Rivers Edge Family Retreat welcomes you to the great outdoors of Ontario, Canada! Located on one of the Countries most beautiful waterways, the Ottawa River and all it has to offer is still a secret to some. Come and enjoy our impressive year-round Executive Family Retreat and lakefront property. Whether you're looking for a true winter experience, the autumn colors of October or the warm & sunny days of summer, Rivers Edge Family Retreat is the perfect location for your weeklong getaways, family gatherings, and reunion with friends or corporate retreats. Our property encompasses a natural paradise of over eight (8) acres including: a 6000 sq/ft modern executive waterfront home with 6 spaciously designed bedrooms, executive style kitchen, Swedish Sauna, pool table and darts, cards, entertainment TV room, all overlooking a 270° water front lake view, natural forest views, on a 600 ft private waterfront setting. You will be kept busy with a vast array of seasonal activities for both winter and summer enthusiasts. Make sure to check out either the summer activities such as swimming, boating, fishing, white water rafting, or our winter activities such as x-country skiing, snowmobiling, ice fishing or a game of ice hockey on the lake. Make us part of your travel plans and book a stay at the Rivers Edge Family Retreat Executive Lodge. We welcome you with open arms! Being a Family of outdoor enthusiasts we have spent many a day enjoying the fun in the sun and the star-gazing nights on the patio at the waters edge. We look forward to sharing our vacation home with you and yours to enjoy all that the Ottawa Valley area puts forth. Growing up in the busy summer tourist area of Muskoka, the Ottawa River gives you a renewed appreciation for beauty and tranquility of a slow paced outdoors. Weather it is just you and your significant other or a full family vacation, this property continues to be enjoyed by many. Heck even as a corporate retreat this property, it's amenities and private setting along with all that it has to offer leaves many memories you will be sure to reflect back on. Our Family and hopefully yours... will continue to realize many more to come!!! When you drive in for the first time to this "Rivers Edge Family Retreat", (hence the name), you'll be sure to experience the pleasantries of the water's edge, or your first sunset, or maybe the smell of the morning dew burning off as the sun rises, but we know for sure... you will realize what we have on so many occasions, our own little private slice of tranquility is here and now! Nestled just outside the small quaint village of Westmeath with local variety/gas/beverage store with all the other ancillary needs, just a 1km walk or bike ride. Don't forget ice cream! Private Sandy Beach with South West Exposure and beautiful sunsets. A gentle shallow slope into the water for the kids and lots of exploring in the water. Sunken living room on main floor. Side by side commercial style Frdige/Freezer in kitchen. Television in Main floor living room, and additional Television in Basement Family room. One off of the kitchen and one off of the waterside main floor bedroom. Small aluminum fishing boat w/ oars. 9 hp motor available to rent during your stay for a fee of $300. Patio table w/ 6 chairs & umbrella & 3 lounge chairs with side tables. Life jackets available (variety) toddler, youth & adult sizes. Five different 18 hole course in close driving distance. 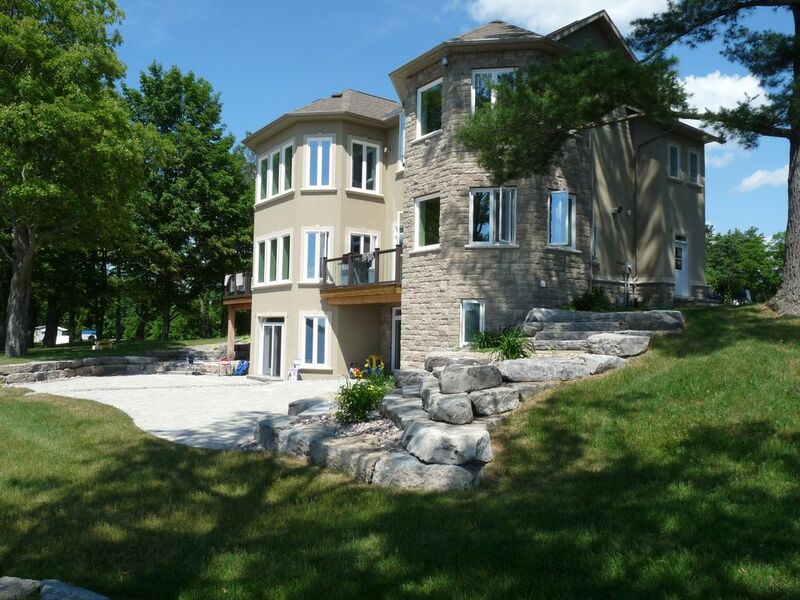 Pristine house on the Ottawa river! Executive house with all the luxury you can only dream off! Simply bring your food, drinks and clothes, the rest is already there! We were 10 adults and all enjoyed the property with its magnificient views on the river from anywhere inside the property. We will be back for sure! We spent a week (8 adults and four kids age three and under) and couldn't have chosen a better location to get together. The home and water access are wonderful. Plenty of bedrooms and having the four bathrooms was perfect. The canoe and kayaks were enjoyed by all. The house is well stocked with toys. The little girls loved the dolly beds in their room and the boys loved the little race track on the lower level. Plenty of gathering options...large outdoor patio, family room, dinning room; even the kitchen was never overcrowded. Heather was friendly, helpful and even brought fresh veggies for us to enjoy. Lovely place! Well stocked for kids and adults. Weather was great the whole week!!! Wonderful place for family vacation. Perfect three generation family gathering spot! We will remember Rivers Edge for the rest of our lives after our wonderful month there. We are Texans but our family in Luke's several Canadians and we sought out a large house where many children and grandchildren could gather. Everything was there for adults (gourmet kitchen, spacious and gracious house, lots of bedrooms). For the children ages 1-14, there was everything from big wheels to a pool table. The kayaks and/or rowboat were used by almost all ages from 84 to 5! The view from the chairs on "the back 40" is sublime. Don't hesitate to rent this. It is really special - except we may come back! Thank you for allowing us use of your Westmeath home! We had a fantastic time. We sincerely appreciated having so many amenities available to us to make the stay that much easier. Our group, while not huge in size definately appreciated having the space to be able to have adult conversations and still be in ear shot of the kids! I can't tell you how many times my friends and i said, "they (Teresa & Grant) have thought of everything"! The kids thoroughly loved being able to splash around in the beach area, fish off the deck and play with the countless toys you had available to us. This allowed for the adults to enjoy a relaxing weekend. Cradled between the Ottawa River and Algonquin Provincial Park in Ontario's Highlands, the Ottawa Valley is a place steeped in culture where you can immerse yourself in our unique blend of heritage and outdoor recreation. This Executive Vacation home is in the middle of Ontario's Adventure Playground. With more than 2.4 million hectares (6 million acres) of pristine waterways, rolling woodlands and forests, our river and trail networks challenge and test the might and mettle of every explorer to our region. Renowned as the Whitewater Capital of Canada, the Ottawa Valley is home to more than 900 lakes and four major river systems, including the mighty Ottawa where we are located or a short ride to the Madawaska, Bonnechere and Petawawa rivers. We invite you to raft, kayak, canoe, surf and fish in our water bounty and explore and discover our rocky, rugged, serenely dramatic and breathtaking landscapes. Weather it is to get away for the summer sun, Ottawa Valley incredible fall colors, fishing and hunting, or all that winter has to offer including Snowmobiling, Skiing or ice fishing, our Executive style home can accommodate a couples private get-a-way to a full family of 12 vacation gathering. For adventure and exploration, a romantic getaway or family holidays, the Ottawa Valley is your place to stay and play and our home is your's to enjoy in a luxurious setting! Rates are subject to change until booking is confirmed. If excessive cleaning is required after your stay, a $350 cleaning fee will be retained from the security deposit. If there is damage to the property and/or it's contents the repair/replacements costs will be retained from the security deposit. Any damages in excess of the security deposit amount will be charged back to the renter.